© THE UNION: 27 year old Karen cools off. After a lengthy struggle with MDR-TB, she is now cured and free to enjoy a healthy and fulfilling life in Medellin, Colombia. Preventable chronic respiratory diseases are under-recognised, under-diagnosed, under-treated & insufficiently prevented. Although breath is fundamental to life, lung health is less well recognised as a critical health factor than other indicators, such as weight and blood pressure. However, anyone who has struggled to breathe, even for a short time, knows how essential it is. The term chronic respiratory diseases (CRDs) describes a range of diseases of the airways and the other structures of the lungs. They include asthma and respiratory allergies, chronic obstructive pulmonary disease (COPD), occupational lung diseases, sleep apnea syndrome and pulmonary hypertension. Allergic rhinitis or “hay fever”, sleep apnea and pulmonary hypertension are other chronic respiratory conditions that affect the lives of millions worldwide. Worldwide 235 million people are affected by asthma. It is the most common chronic disease among children and also affects adults. The causes of asthma and the reasons for its increasing prevalence in low- and middle-income countries are not well understood. 64 million people suffer from COPD, a term that covers emphysema and chronic bronchitis. 90% live in low- and middle-income countries. COPD caused more than 3 million deaths in 2005. The number of COPD deaths is expected to increase by more than 30% in the next 10 years; and WHO projects it will be the 3rd leading cause of death worldwide by 2030. Nearly 3 billion people rely on solid fuel for cooking, heat and light, exposing them to dangerous indoor air pollution that causes some 2 million deaths each year, primarily in low- and middle-income countries. Women and children are the most heavily affected because they spend more time in the home than men. Dusts and chemicals (vapors, fumes and irritants), as well as tobacco smoke, are risk factors for occupational lung diseases, asthma and COPD. Chronic lung disease touches every aspect of the lives of those affected and their families and communities. Direct or indirect exposure to tobacco smoke is a major risk factor for all lung diseases, as well as other major NCDs, including cardiovascular disease, cancer and diabetes. Effective tobacco control is essential to any strategy for preventing lung disease. Preventive measures, such as adequate ventilation and early detection are vital to addressing occupational lung diseases. Improvements in cookstove technology can help reduce exposure to indoor air pollution in homes. Smokefree legislation protects air quality in workplaces, public places, health care facilities, educational facilities and public transportation. Other air quality controls can reduce and eliminate exposure from industrial emissions, traffic, etc. Associations have been reported between chronic respiratory disease and diet. It is therefore feasible that dietary strategies compatible with those already existing for the control of coronary heart disease, diabetes and cancer could be developed for the primary and secondary prevention of CRDs as well. Evidence shows that a child’s health in the first year of life affects the subsequent respiratory health. Maternal smoking during pregnancy adversely affects the lung function of the child at birth. Treatments differ depending on the condition, though some of the chronic respiratory diseases are incurable due to permanent damage done to the lungs. 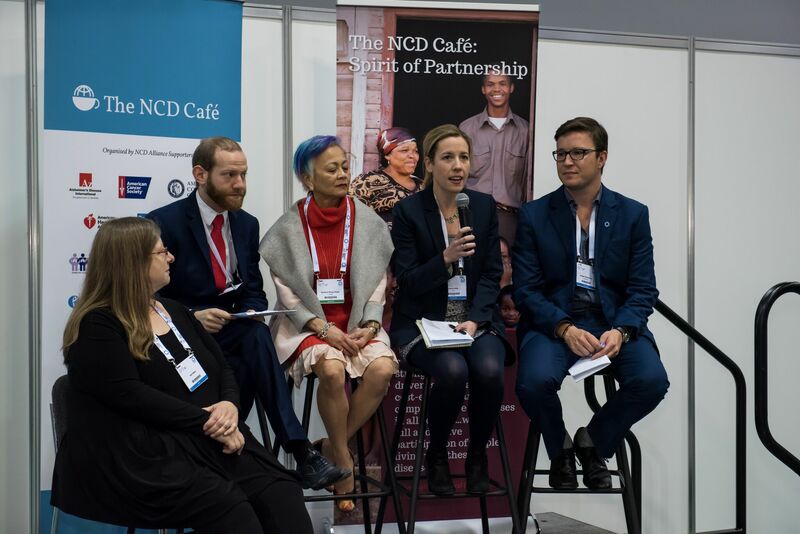 The NCD Alliance Supporters Consultation Group hosted this week editions of the NCD Cafe at the World Diabetes Congress in Vancouver, Canada, and the NCD Dialogues at the 46th Union World Conference on Lung Health in Cape Town, South Africa. The first ever World Lung Day is being marked globally on 25 September. Organised by the Forum of International Respiratory Societies (FIRS), the day’s focus is the World Charter of Lung Health.